An apple a day keeps the doctor away, so says the old proverb. I've been on an apple kick lately, eating my way to dozens of apple cores in the last month. I ate apples with sandwiches instead of chips. I ate apples whenever I had the inkling for a snack. I ate apples before I sat down to meals, and then after. I'm an apple nut. Though I haven't been sleeping as much as I should, I've stayed healthy and well. So does an apple a day really keep the doctor away? To settle the age old question, I'd have to say yes. Who knew it was actually true? The first awkward bite into a ripe apple makes my heart sing. The wide open mouth, the loud crunch, the sweet juice rushing to light up the taste buds—it's a marvelous experience. I love trying different varieties of apples simply to discover their own unique qualities. When I'm looking for a sweet apple, I choose a Golden Delicious. I'd argue Gala apples are the most balanced—slightly sweet, slightly sour, neither virtue overcoming the other. However, one apple has captured my attention in a way no other apple has before. Every year, I anxiously await the moment when the produce department of my local supermarket gives them a seasonal home. I am talking about the glorious, almighty Honeycrisp apple. I don't even care that they tend to be the most expensive apples in the store. I've gladly handed over my pocketbook for a dozen of these and I'll do it again. They are worth every penny. My mother warned me to stave off my apple cravings until my grandmother's apple tree ripened, but I couldn't help myself. Every year, after the apples have been picked, my grandma sends out boxes of apples to the entire family. We picked up ours a week ago and I've been planning ways to use them ever since (my grandmother's tried and true applesauce recipe will be coming your way soon. Keep your eyes peeled!). However, this Apple Cinnamon Cake was on this year's list long before the the apples on my grandmother's tree turned red. I've made this cake every fall for the last three years and it's quickly become an autumn tradition in my home. I hope you give this cake a chance to become a tradition of your own. 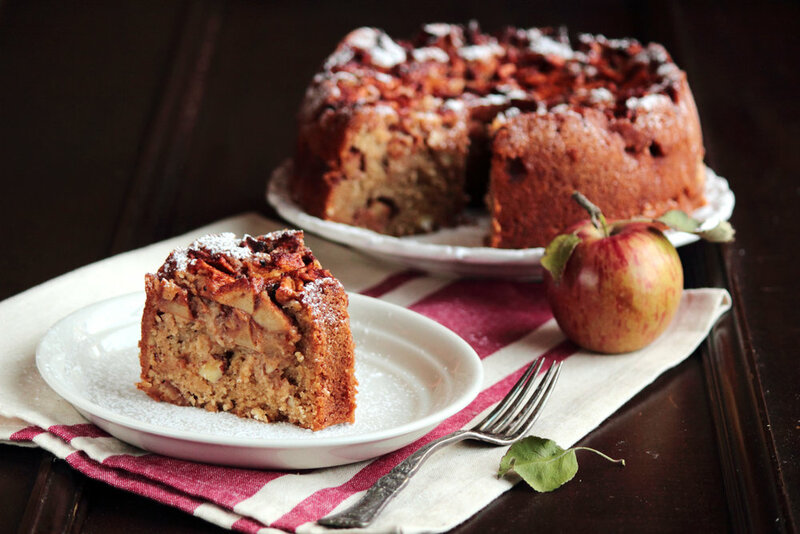 This Apple Cinnamon Cake is layered with beautiful depth of flavor. A nutty, sweet whole wheat cake is interrupted with layers of cinnamon-coated apples. The apples give the cake an unbelievable moistness and density you have to taste to believe. A light dusting of powdered sugar really sets this cake off right. This is a good cake to enjoy with a cup of coffee and a fall afternoon. Preheat oven to 350 degrees F (180 degrees C). Grease a tube or bundt pan. Place apples in a large bowl, sprinkle with cinnamon and 1/4 cup sugar, and stir to coat evenly. Set aside. In a large mixing bowl, mix together the all-purpose flour, whole wheat flour, baking powder, and salt. Beat in the vegetable oil, 1 cup granulated sugar, brown sugar, apple cider, vanilla, and eggs until combined. Stir in the walnuts or almonds. Place half the cake batter in the prepared pan, layer on half of the cinnamon apples, the rest of the cake batter, and the rest of the apples. Bake for about 90 minutes, or until a toothpick inserted into the center comes out clean. Run a knife around the edge and cool in the pan before turning the cake out. Dust with powdered sugar, if desired.